After the shock wears off – after it’s replaced by anger and fear and then sorrow – we continuously end up in the same intellectual cul-de-sac: what can we do? Everyone plays their assigned role, like we are trapped in some grim kabuki play that always, always ends the same way. The gun nuts take to social media, bombarding everyone with all-caps variants on “guns don’t kill people, people kill people.” The bigots bleat that “lieberals” and “libtards” are to blame, because they let in Muslims and people whose skin isn’t white – you know, white as a Klansman’s sheet. And, naturally, Ezra Levant and the winged monkeys at Rebel Media fundraise with it all. The chiefs of police recite statistics, noting (correctly) that crime is down, insisting (incorrectly) that the police could do more if they simply had bigger budgets. The conservative politicians tweet “thoughts and prayers,” which has become 21st Century code for “I plan to do nothing.” And the liberal politicians wring their hands and pass laws that will also achieve nothing – because there are already nearly eight million firearms in the country. Now. And, by the by: more than a million of those guns – like the one the killer used the Sunday before last – are already restricted or prohibited. His was stolen in a break-in in Saskatoon a few years back, before it commenced slouching towards Toronto’s Danforth Avenue. And we in the media? We always play our assigned roles, too. Those on the conservative side of the spectrum shrug, and regurgitate the talking points of the NRA and its foul ilk. They call handgun bans “virtue signalling” symbolism – forgetting, or not knowing, that all of politics is about symbols, and the ceaseless pursuit of virtue. And those of us in the media who mainly congregate on the left side of the continuum? 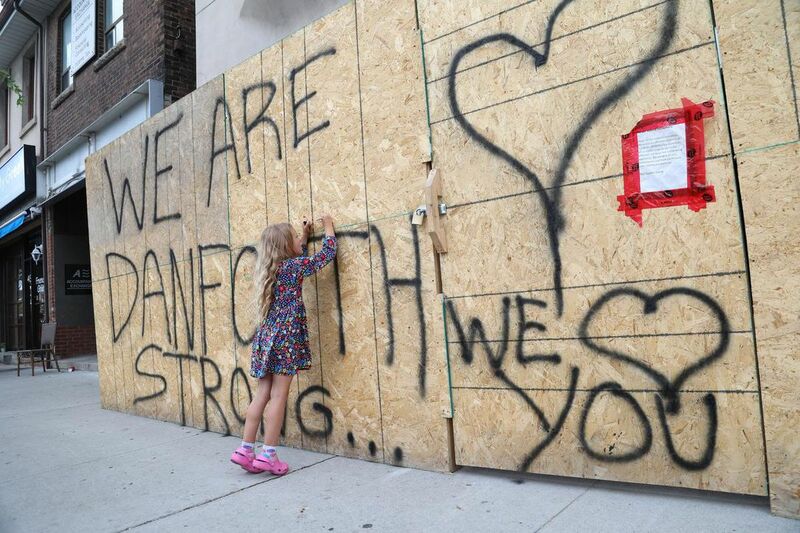 Well, let’s talk about how we have handled the slaughter on the Danforth by first admitting something, shall we? We didn’t know Reese Fallon. Sure, this writer may have met her, once, when Beaches-East York MP Nate Erskine-Smith – who did know her – held an anti-racism event in Toronto’s Beaches neighbourhood. Erskine-Smith had a number of Young Liberal club members there, helping out. Reese was a member of that club. This writer remembers feeling sorry for these young people, because a group of neo-Nazis and white supremacists had shown up and were disrupting the meeting. It was pretty ugly. So, most of us didn’t know her, and we will (sadly, tragically) never know her. We do know, however, that she was on Toronto’s Danforth Avenue for a birthday celebration with friends. We know that one of her Young Liberal friends was there, too – and young woman who was wounded and taken to hospital. That’s what we know. That’s all that most of us will ever know – as we go on with our daily lives, and as Reese Fallon’s lovely face fades into what Ralph Waldo Emerson called “the Eternal Fact.” As she slips into some press clippings and our collective memory, joining the legions of others who were slain by a madman – because they are almost always men, aren’t they? – carrying a gun in their hands, like some black snake spitting death. Here, too, something else we know, or should know: it was appalling, and wrong, for CBC Radio in Toronto to devote a lot of time, two scant mornings after Reese Fallon was slain, to the killer. In one part, they had what sounded like a professional actor breathlessly read the letter his family sent out – the letter that had been written by a professional spin doctor, and not the family. In another part, they had a youth worker who knew the killer come on, and he genially related how the killer had “a million-dollar smile” and how he was “humble and reserved.” It went on and on and on like that, for a long time, on CBC Radio. This writer doesn’t know if any those things are true, either. Maybe they are, maybe they aren’t. Most of us, however, don’t usually associate having “a million-dollar smile” with people who slaughter children on a city street. In the end, as the blood-soaked kabuki play goes on and on, what we do know is this: it isn’t just politicians and the chiefs of police who have a role to play. They aren’t the only ones with a responsibility to prevent other Reese Fallons from being executed on the next available hot Summer night, simply because they were in the clichéd wrong place at the wrong time. Those of us in the dwindling ranks of the media have a role to play, too. And that role does not include treating the killer with more deference than the killer’s victims. Before they – two innocent children, for the love of God – are even in the ground. This whole experience has been senseless and tragic. There seems to be lots of differing stories coming out about the shooter that it’s getting to the point of wondering what to believe. One example is the report he had been seen with a weapon (probably THE weapon) by security outside his apartment building just a couple weeks ago. But who knows. What’s been bothering me more and more is the leadership of our PM and PMO. I’m really trying to not politicize this, but where was he? I mean, I know he was on vacation, but what really irked me is aside from a tweet sent out by more than likely a staffer, when the PM can’t be bothered to cut short his vacation to handle a tragedy such as this it makes one wonder about priorities and leadership. Despite the tweet whether it was written by him or not, I’m sorry but this country cannot be covered in 140 characters or less (or whatever the amount is). My 70 year old parents aren’t on twitter and neither are most of my friends. I understand him not showing up for the first day or 2 in order to let investigators do their thing. But it just really bothers me that our PM was MIA during all of this. Even taking a day or a moment to address this and go back to his vacation would’ve sufficed. The fact that his vacation is over and he plans to go to Toronto today is a bit too little too late. Quebec mosque shooting January 29th 2017. Justin Trudeau (along with the other federal party leaders) attend a vigil near the mosque the next night, January 30th 2017. He then led the procession that walked to the mosque to place flowers. If I lost a child or a loved one in an incident like this, I fear I would have to isolate myself from the world for some time to prevent my grief from descending to rage. Politicians offering thoughts and prayers, teddy bears, candlelight rallies, grief counselors, gun control advocates, instant experts on the perp, media analyses, interest group statements…all would infuriate me and give me no comfort at all. The only people I would be grateful for would be those who took the time to offer a brief moment of reverent silence and resolved to keep their opinions to themselves for a respectful period of time. Whenever a terrorist hits the MSM, and society, via the news cycle, the CBC has a fiduciary duty to report on it. As myriad partisanship starts to foment news cycle hysteria in the population due to either race or religion the news outlets have a duty to quell the hysteria by focusing on the determinants that prime the rumour mill. In this case the rumour mill is focused on whether the gunCoward was the product of International Terrorism or so-called ‘mental illness’. In this case we have much to sift through given the mental illness factor and the International Terrorism factor. Bottom line is that the MSM, and population, tend to focus first on that which is sensationalized via the MSM and rumour mill Internet. Moreover, the Alt.Right on Internet is primarily focused on the International Terrorism factor because it fits with the Steve Bannon narrative of propaganda that the right-wing partisans have a tendency to fuel up on when these incidents manifest. The CBC has a call to make when incidents like this happen and countering Alt-Right propaganda emanating out of the USA is, unfortunately, part of the job of a news reporting agency like the CBC given their federal government subsidy in contradistinction to the private players like CTV. Just an observation here given the factors in play. Honest, truthful journalists have no business countering anybody’s propaganda. That is a job for political actors, citizens, and opinion columnists. But I think that’s actually the point, Warren: the very fact this guy had a million dollar smile shows us that whether it’s extremism or mental illness, these murderers can’t be easily identified, and that they can’t all be lumped into simple categories (the angry, glowering lone gunman who lives in his mother’s basement, for example). “because they are almost always men” you’d be surprised, there are more female mass murders then you’d think, but women prefer poison to guns (which is true of suicide attempts too). I guess those living in Toronto should accept as per the Mayor of London. Part of living in a big city! Still feel the only way to address this and lower the possibility of a recurrence is a hard line policy from government. Criminals will never abide by the laws of the land. Make it known that possession of an illegal weapon in a public place is punishable by at minimum 1 year in jail. The only way to get the attention of criminals & evil doers is to take them away from privileges offered to law abiding citizens. Then restart the practice known as ‘carding’, where young men of a certain age, ethnicity and socioeconomic background are stopped randomly and checked by police.Let the usual suspects scream as loudly as they want: the fact is, IT WORKS. Harper tried to set mandatory minimum sentences for gun related offences. Judges refused to apply them. How about working so that they don’t become “criminals” in the first place, by treating them with respect and ensuring they have opportunities. We already do a decent enough job of that to have a crime rate a fraction of the US. Maybe there is a p0urpose to knowing he had a million dollar smile. Or was friendly. Not to excuse him. But to let people know most killers don’t stand out in a crowd. Most people with mental illness don’t show symptoms outside. It’s not a comforting thought. But when not in the grip of an out of control episode, we all look alike. Guns are not healthy for living creatures. It’s a tough needle for the media to thread after atrocities like this. First, the climate in which we live necessitates, unfortunately, that as much about the killer is confirmed ASAP – otherwise the fringes quickly fill in the blanks, and society has repeatedly proven that they are largely incapable of separating fact from nonsense. Secondly, while we are curious to know the victims, people are REALLY curious about the killer; who were they, why would they, with whom were they, and so forth. In the hyper-competitive “marketplace” the media and us as consumers have created, you can’t blame CBC or anybody for pursuing answers to the questions the majority of people are asking. Third, while anger and contempt towards the killer are appropriate, seeking to understand who he was is not thumbing your nose at the victims. The kind of polarized, black/white, us/them, right/wrong approach is toxic. We’re intelligent humans – well, most of us, anyway. We’re fully capable of experiencing and managing multiple emotions, attitudes, opinions, and perspectives. How did we collectively become so incapable of critical thinking, not to mention thoughtfully approaching the events around us? Thank-you. I completely concur with your well crafted commentary. And as I am one of Ezra’s “Winged Monkeys” (at least I subscribe to his service and enjoy it) I am always surprised when I agree with you – which although I don’t keep track or seek you out very much – seems fairly often.